Even though summer is here, the high season has not yet really started: the children still go to school and for families the holidays have not yet started. The first weeks of July still have availability, but the site has many visitors, and like every year these weeks will certainly be filled at the last moment. Make sure that your calendar is up to date! And, of course, you can place a Last Minute Offer. After 6 years in the Tarn near Cordes-sur-Ciel, we have moved to the Tarn et Garonne. Our office is now located in the picturesque village of St Antonin Noble Val, a medieval village on the banks of the Aveyron. We have also changed phone numbers with dedicated numbers for calls from France, the U.K., Belgium or the Netherlands. These numbers allow you to contact us and benefit from local tariffs. In the Netherlands, the summer Holidays start quite late this year. This partly explains the fact that the last weeks of June and early July are not yet filled. This year again, we have noticed a trend to book at the last moment. This explains the increase in the number of visits we can see in recent weeks. After a rather quiet period in April and early May, the ads on Gites.nl have been viewed more than a million times in the last 30 days. This abbreviation stands for "Search Engine Optimization" - ie, optimising the use of search engines. In other words: how to be better found through search engines, like Google? We invest a lot of time and energy in this activity, and the results are visible: We have significantly improved our visibility on search engines, particularly with regard to individual advertisements. If you search on Google with the keywords "Gites France" and add the name of your gite to your search, you have much chance of falling directly on the link to your advert on Gites. When you describe your property, enter the words "Holiday," "Apartment" or "B & B" before the name of the property. 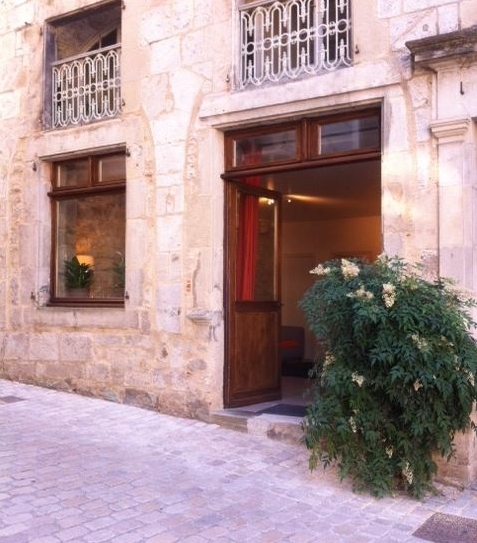 Do not say: "La Perle" is comfortably furnished - but "Gite La Perle is comfortably furnished." Use keywords that best describe your property. Feel free to describe features that may correspond to a very targeted internet research. Do not be afraid of having too much text; an avarage of 600 to 800 words per advert is fine. Mention the name of the area where the property is located a number of times in the text: the name of the town or village, but also the name of the department or region. Try to integrate these words in a fluid and coherent text. 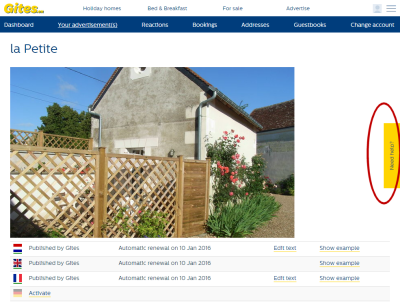 Gites applies to improve site visibility with “static” textual elements - For you as an advertiser, it is important to highlight all the features that are characteristic for your property. Entering a website address in the description of your property is not a good idea: first, it gives the impression to users that you haven’t made enough effort to provide full information in your advert on the Gites site ; secondly, it will have a negative impact on the visibility of your ad. If you have made changes to your advert and you would like to have them translated, please don’t hesitate to send us an e-mail telling us that you have made the changes. We will take care of the translation if the changes are reduced to minor alterations in your text. On Gites you have also acces to an online help desk. By clicking on the "Need Help" tab while logged on our site, you can access answers to frequently asked questions, but also tips for optimising your advert: How to activate the advertiser’s page; How to update your pricing; Understanding your statistics; etc. Please do not hesitate to contact us if you believe any information should be added or if our explanations are not clear. 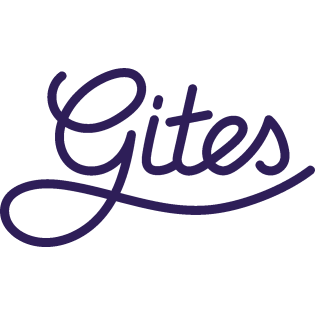 Gites sends the messages from visitors through the contact form on the website to one or more addresses that you have filled in in your advert. To make sure you don’t miss any inquiries you can always find the mail in your inbox in your user account. We do everything to make sure that the e-mail we transfer to your e-mail address meets all mail protocols. Still, it sometimes happens that e mail from Gites ends up in the spam box. You can prevend this to happen by putting e-mail from Gites on the ‘white list’.